It is a pleasure to join all of you this evening for the Bike Ottawa Annual General Meeting. 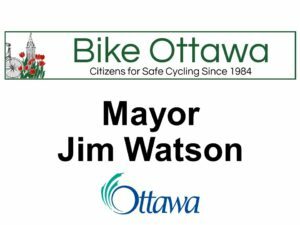 I would like to thank Bike Ottawa, your President, Gareth Davies, and your Board, for welcoming me tonight. 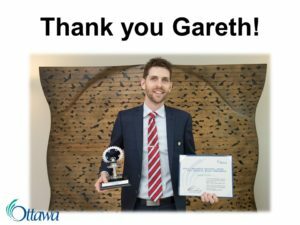 I don’t have to tell any of you that Gareth is a tireless cycling advocate here in Ottawa, who was recently named the recipient of this year’s Bruce Timmermans Award for the individual category. 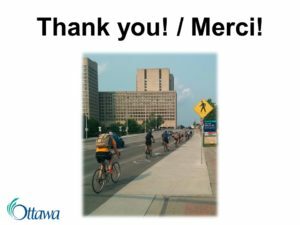 Gareth, thank you for your hard work bringing people together to collaborate and make cycling safer in Ottawa. We have a lot of experience in the area of cycling here with us tonight, and I want to thank all of you for being here and for sharing your insights with us. 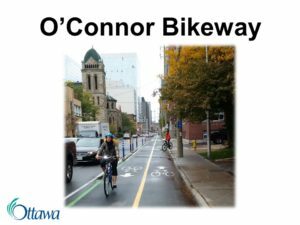 For more than three decades, Bike Ottawa has been promoting cycling as a safe, fun and environmentally-friendly form of active transportation. We are fortunate to have a tremendous, diverse and active cycling advocacy community within our city. Rarely a day goes by without an individual or advocacy group contacting their Councillors Office, my office or staff to ask for improvements or to address issues. It is this type of ongoing collaboration that leads to tangible improvements on the ground. In fact, the initial deployment of automated bike counters in 2009 was thanks to one of your volunteer-led initiatives. 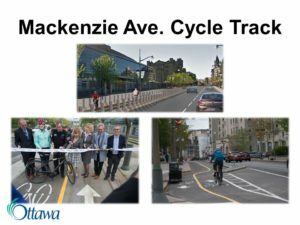 I would like to take this opportunity to thank Bike Ottawa for their continued advocacy of cycling in Ottawa, and for their partnership to make cycling even better in our city. As a growing city, we have many competing interests that I hear about from residents, stakeholders and Councillors every day. And I am proud of the progress we have made as a cycling-friendly city. Being a cycling-friendly city includes not only the healthy benefits of an active lifestyle, but also the reduction of congestion for all commuters, by getting people out of their cars and onto the bike lanes and pathways. We are investing more than ever in active mobility and we are increasing our emphasis on awareness campaigns around issues impacting cyclists, pedestrians and motorists. Just last year in Budget 2017, we included more than $8 million of investments in cycling infrastructure through the Community Connectivity Program, the Cycling TMP Cycling Strategic Initiatives and through investments in paved shoulders. This investment will help us reach our goal of adding another 72km of cycling facilities to the City’s growing network by 2018. 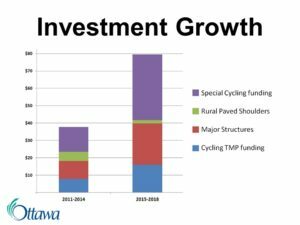 When combined with funding from other levels of government – the total investment directly attributed to cycling and major bike/pedestrian structures within this Term of Council will hit $80 million. This is a historic, record investment in cycling and active transportation. To put that in perspective, this is compared to $27 million spent in the last Term of Council – which represents a 270 per cent increase. While there is more work to do, this is something we can be very proud of. This is in addition to the cycling facilities that are constructed as part of road renewal and new road construction programs. 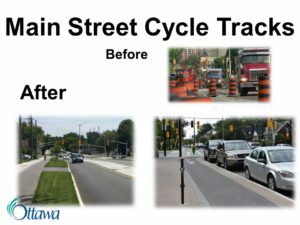 One such example of this is the new Main Street cycle tracks, part of our complete streets plan. These cycling tracks, as one neighbour told me, humanized our streets. The commitment to active mobility is a true partnership, with the Federal and Provincial governments. Their support has helped us leverage local resources, which has translated into tangible improvements citywide. 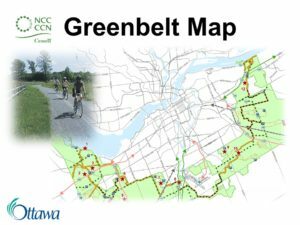 The NCC is also a partner as they work to expand their network through the greenbelt, as well as make ongoing investment to fill-in missing links. These relationships are important, as we need their collective help in creating a fully connected network. In addition, construction just started on a new $21 million dollar pedestrian/cycling bridge over the Rideau Canal, from Fifth Avenue to Clegg Street. My thanks to Yasir Naqvi, MPP for Ottawa Centre and to Catherine McKenna, MP for Ottawa Centre, for their tireless efforts on this exciting project. 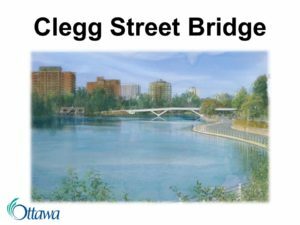 The Clegg Street Bridge will not only provide pedestrian and cycling connections to Lansdowne Park, but it will also improve access to Hurdman and Lees LRT stations. 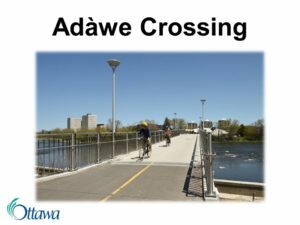 The bridge will create an alternate crossing to the Bank Street Bridge, connect the downtown bike network to Old Ottawa East and Main Street, and will improve access to the Old Ottawa South via Riverdale Avenue. 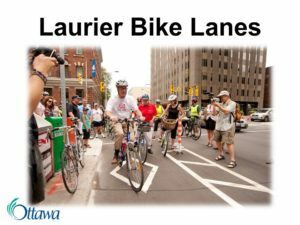 We also made a bold step towards a more cycling-friendly city in 2011 with the Laurier Bike Lanes pilot project. This 1-kilometre long cycling facility almost immediately became one of the top routes for cycling commuters, including students through the busy downtown core. 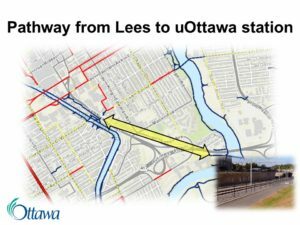 Today, the Laurier Bikes Lanes are a key part of a 12-kilometre link from Vanier to Westboro, with only one remaining gap of less than 100 metres, which will be addressed after the LRT bus detour is removed. 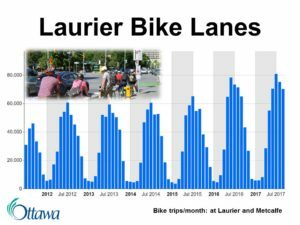 The Laurier Bikes Lanes are part of a longer continuous facility that has hit peaks of 4,000 cycling trips in a single day – which is wonderful news! 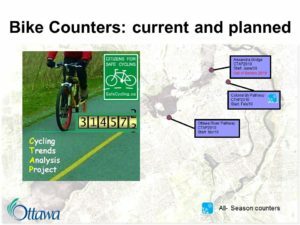 For instance, since the Laurier Bike Lanes were installed, on average 34,632 monthly trips have been recorded on this important East-West route for cyclists, totaling 2.6 Million bike trips since their opening in 2011. 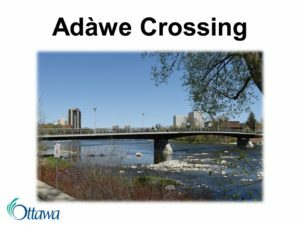 I have also heard from many residents – and not just cyclists – about the major impact that the Adàwe Crossing is having on their lives. The crossing is being heavily used both by cyclists and pedestrians – in fact, as of last night, we have recorded 1.477 million crossing since its opening in December 2015. Just under half of those crossings were made on bicycle. With a new public sports centre soon to open at the former site of the Rideau Tennis Club, which will bring more sports to the 105-year-old facility, we are sure to see this number grow moving forward. Within the Greenbelt, we have already achieved a five per cent cycling modal share, and we are on track to meet our target of 8 per cent by 2031. 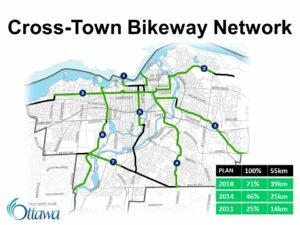 By 2018, The Cross-Town Bikeway network will be 70 per cent completed within the wards depicted above once implemented. In addition to the investments and progress made specifically on cycling and pedestrian connectivity, our Light Rail Transit project will also have a significant positive impact on cycling across our city. Starting next year, we will see new cycling infrastructure coming on-line as part of the Confederation Line project. 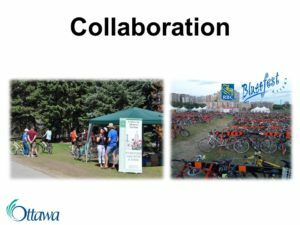 Integrating the Stage 2 LRT alignment and stations with local pedestrian and cyclist networks was one of the key principles of the project. 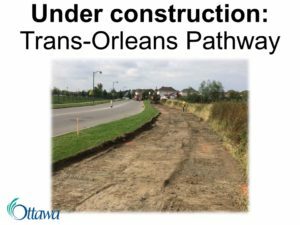 As part of the Stage 2 LRT extension – a major new pathway inter-connecting the Doug Thompson and Sawmill Creek pathways which together provide a connection to Osgoode Village. 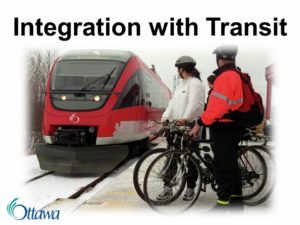 These are just two examples of how staff is working to integrate a multi-use pathway system into the planning of our future rapid transit system. 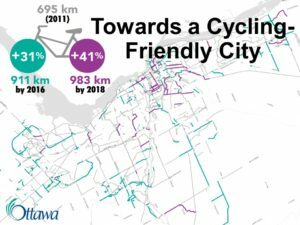 Although cycling commuting is typically concentrated where population density is the highest in the inner wards, the demand for improved cycling facilities is also being felt across the city and within suburban and rural communities. 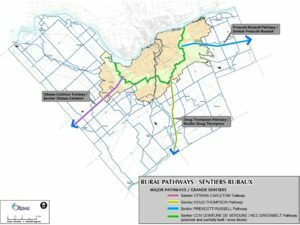 As well as safety improvements for cyclists and pedestrians along sections of Campeau Drive. This opens up active mobility options for nearby residents – to get to work or to explore the areas in which they live. 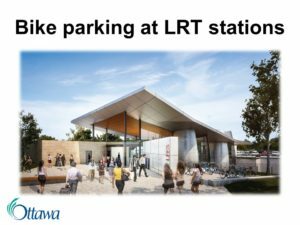 In addition, cycling can become an important first link for long-range commuters when they use our new LRT system. That is why we are working to ensure strong connectivity to public transit and improved bike storage and parking at transit hubs, such as new bike shelters and enclosed bike parking areas. As you would know, getting more residents in the habit of cycling to transit can free-up park and ride spots, reduce congestion and make the combined trip more attractive than taking your vehicle downtown. This year, we have also taken the first steps in promoting the rural areas as cycling destinations. As you can see behind me, we have developed three major pathway corridors across our rural areas – the Prescott-Russell Pathway; the Doug Thompson Pathway; and the Ottawa-Carleton Pathway – and we are expanding the network of roadways with paved shoulders to facilitate cycling. I know that an issue on top of mind of many cyclists is also cycling safety. 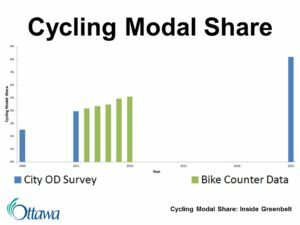 The good news is that the collision trends related to cycling are decreasing and moving in the right direction. But we know there is always more work to be done in this area. There are still too many bad motorists, and yes, bad cyclists. We need to continue to educate and to enforce all traffic rules for both. In high volume areas, new design standards and complete streets are providing more separation and protection for cyclists. Behind me is an image of a new protected intersection at Dynes Road and Fisher Avenue. 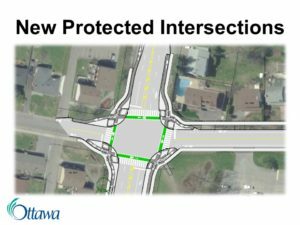 This will be the first fully protected four-way intersection in Ottawa, which should be fully operational by the summer of 2019. Improving safety requires the development of new habits and awareness by all road users – motorists, cyclists and pedestrians. I am encouraged at what we have achieved together – particularly since 2011. 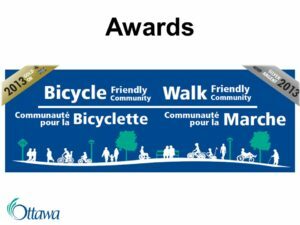 In 2013, Ottawa became the first city in Canada to receive the Gold Bicycle Friendly Community Award, and we continue to be a leader in cycling infrastructure. Looking ahead, our focus will continue to be on network connectivity, increasing quality and safety of facilities and intersections, and making cycling and active transportation effective options for accessing public transit. I am confident that we will continue to work together towards these common goals. Thank you. / Merci beaucoup. Next: Next post: Experience Mìwàte!